If I suggested that you and I run across North Dakota together, all 360 miles in 11 days and we were ages 34 and 65 would you think I was insane? Even if we had just run the Fargo Marathon in May and were in running shape, it still sounds crazy, right? Splitting the running across North Dakota between two people is like running six consecutive marathons in eleven days. No matter how I tried to rationalize why my former co-worker and college friend, Elisha and her dad would run across North Dakota I could not do it. 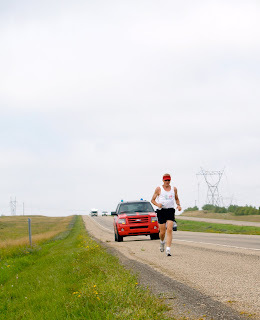 My curiosity peaked and I set out to meet Elisha along the North Dakota route to see her run and understand why she and her father took on this challenge. 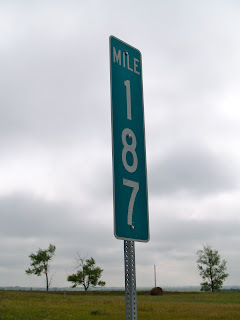 First, I drove 70 miles from my remote prairie North Dakota home and came upon mile marker 187 on Interstate 94.
behind her dad, Elliott, age 65, as he finished up his final leg for the day. It was nearly lunch time and they had been running since 6AM. The background of Friday’s run was the prairie I call home combined with the passing cars and semi-trucks on the interstate highway. Elliott told me while training with Elisha for the Fargo Marathon that in early May he suggested to Elisha they keep up their training to run across the state later in the summer. Elisha, a personal trainer, has been up for any physical challenge as long as I have known her. My memories go back to when her high school basketball team used to beat my high school basketball team by a minimum of 20 points a game and then to her years as a collegiate basketball player winning a national championship. No matter what athletic achievement I ever attained I don’t know what could convince me running across the state of North Dakota could and would be a good idea…especially now that I am a mother of three children in my 30’s. However I learned Elisha and Elliot have purpose to their challenging run. Elliott was a long time insurance agent and knows firsthand about the 11,000 North Dakota children that get health care coverage through the Caring for Children program. It provides primary and preventive health and dental care to kids from hardworking North Dakota families that do not qualify for government programs, yet do not have private insurance. As Elisha and Elliott run, people are donating to the Caring for Children program to prevent future kids across North Dakota to not slip through the cracks of our health care system. Learn more or donate here. If you are on Facebook, you can “like” the Run North Dakota page, here. As a mom, I can get behind my friend and her dad running on behalf of working North Dakota families and their children. Elisha and Elliott are a tremendous father daughter team, encouraging one another to keep going mile marker after mile marker, while drinking plenty of water, Gatorade, eating protein bars and Elliott’s favorite, Snickers with Almonds, which he eats three of every morning between running. I was a proud North Dakotan as I watched for six miles what Elisha and Elliott are doing. I was inspired to see first hand two individuals push themselves physically, while raising money for kids. Kids that live where I live, that may sit next to our son in our rural public school will directly benefit from Elisha and Elliott’s fundraising. When Elisha and Elliott reach their daily mile goal, they celebrate with a photo. On Friday, Elisha ran an extra three miles, knowing the heat would be brutal this weekend. It was 102 degrees today with wind gusts to 40 miles per hour. Through it all, the run continues for Elisha and Elliott. Tonight they are resting in Jamestown, ND and have 100 miles left to complete when they plan to finish on Thursday, August 26 on the Main Avenue bridge along the North Dakota/ Minnesota state line. I may never run across my home state to raise needed dollars for children. But Elisha and Elliott gave me a reminder to what my dad often said to me as a kid and young adult, “Do what you can, with what you have, where you are.” That motto is what Elisha and Elliott are doing for working North Dakota families and their children. It is one I support and a motto I live by for family, for my community, for North Dakota and for my country.